The joy of social media is that it's possible to enjoy events that you're thousands of miles away from! I'm not at Viva Las Vegas this year (it's the biggest Rockabilly weekender) but I'm enjoying the fashion from afar! Here are my sparkling highlights for drop dead dresses that shine. 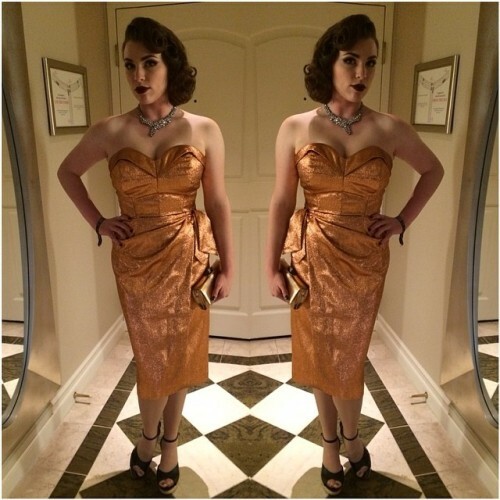 The gorgeous Susan @brwnpaperdolli is rocking this vintage silver bombshell dress. Donna @d_rose is wearing a dream dress. I'd love to wear something like this one day. Her hair is amazing too. Desi @pinuprevivial is doing sparkly in a different way - look at this ace two piece! I love how Angie @missangiea keeps in simple, but so glamorous in this gold number. @thebillynova took this pic of @vaudevillelovey screaming fabulous in her red sparkly dress. I love how it clashes with her hair. The super cute Sophia @foxysofa bought her pink sparkly dress at Viva - from Pin Up Girl Clothing. Autumn @autumnpinup is wearing a Whirling Turban dress, I've always wanted one, and seeing her in her custom one makes me want one even more! !